Multiple User ID with individual menu format. Zoom function and batch can assign authorize ID. Delete or modify can setup password. Easy to create the Account Code, Easy Search and Easy to Remember. User can key in the Past unpaid bill from customer and supplier. User can apply the historical Credit Note, Debit Note and payment. Print Statement and Overdue for payment. The system will automatically remind user if once account is overdue. Emas Accounting offers flexible and effective Multiple-Currency capabilities for companies conducting international business. Reports can be printed either in customer’s currency or your base currency. Currency Gain & Loss is provided automatically. The Customer Statement can be consolidating into one statement. E.g. your customer has 5 branches or subsidiaries and you require printing 5 branches or subsidiaries statement and consolidating into one statement of account. Assign budgets for each account in the chart of accounts. You can print the balance compared to the budget, showing variances. Issue Invoices, Cash Sales, CN, DN, Goods Received Note, Goods Return Note, Officier Receipt and Receipt Voucher and Payment Voucher, user Accounting tyransaction is automatic prepared by the system so do the Invenrol reports. Auto Apply Invoice while entering payment voucher and Officier receipt. Multple payment method in one officier reciept. After modify /delete, the applied bills is auto reverse the modified transaction only which also allow to reapply the invoice or payment. System is guide or prevent user enter the wrong account. Easy to delete or modify with strong security permission. When you enter the payment or receipt voucher entry, the system automatic prompt out the unpaid bill for that particular customer for user to select which bill to pay. The system is prompt out with different currency trade in. The system can handle the project account. It will provide you the financial report base on the projects. The systems can handle the manufacturing account and producing the cost of goods produced and manufacturing Profit and Loss reports. User can define unlimited financial reports format with different calculation. This can eliminates the unnecessary to export data to another program in order to produce reports. All Reports can convert into MSDOC, Excel, BMP, TXT and PDF format. All reports can merge into one PDF files. All reports can email or fax directly. All reports can search when preview. 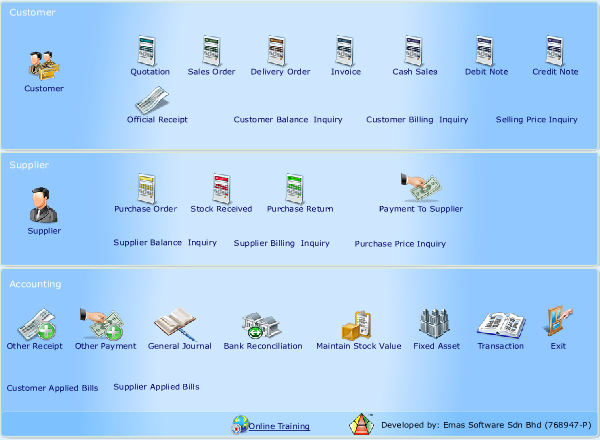 You can consolidate subsidiaries, departments and projects account into a merged or parent company in Emas System. At E.M.A.S. Accounting, we believe we are the right choice for companies in search of accounting software that will meet their needs for years to come. Give us a try, we know you will agree. Why buy Emas Accounting Software? Automatic Accounting Done without spending any time. It makes users easy to understand and operate. Layout with big button which is easy to view and click. Today professional businessman needs advent security to protect user valuable information.The system should able to assign job & responsibilities.The system should able to track who delete, enter, & change the transaction. -Auto Backup and auto list in the list of company menu.